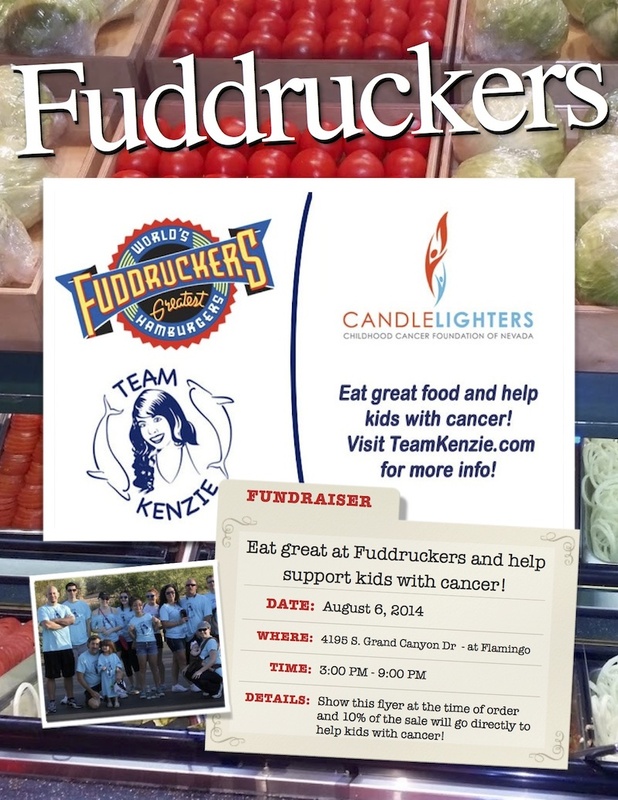 Team Kenzie for Candlelighters Night at Fuddruckers! Fuddruckers' goal is to "make the world happy, one burger at a time" and now you can help make a child with cancer happy by joining us on August 6th, 2014 for dinner, where 10% of your sale will go to Candlelighters Childhood Cancer Foundation of Nevada! Fuddruckers is hosting a burgers for benefits night for Team Kenzie at the West Flamingo and Grand Canyon location. Join Team Kenzie from 3PM - 9PM on Wednesday, August 6th and get your Team Kenize t-shirt! Be sure to show the flyer to the cashier at the register so they know you're there supporting Candlelighters! Get Your Team Kenzie T-Shirt! to get your Team Kenzie T-Shirt!